This is a big research that I’m working on, I’m so thrilled to dig more to reveal more and more stories from our own history. Here I’m sharing a piece that amused me, it’s a spread from Ibn al-Nafis book: Compendium of the Canon of Medicine which he wrote around 1240 CE – 1288 CE, I added some guiding graphics to emphasis my findings. My favorite book seller has called me few days ago to see his new (historic) collection of Arabic manuscripts and books, it was a leather bag contains couple of tens of different manuscript from different origins, and another five books that are totally handwritten. The subjects of these books and manuscripts were about Islamic religious provisions and some Arabic language grammar. 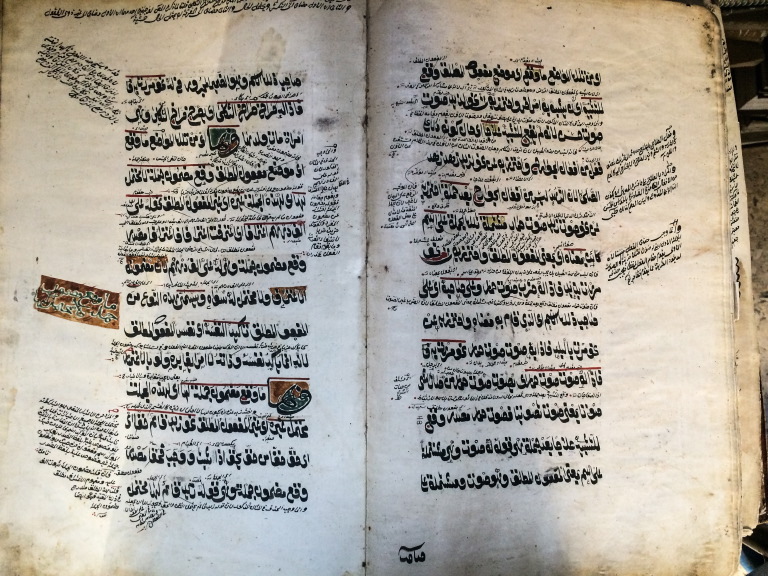 I was amazed by two books from the collection, they have got a very unique styles for the margins, which was an important space in each Arabic book, so the author or the scholar could write more comments and highlights that are connected with the page content. The source of one of them was Dagestan, 1903, and the other book is unknown, but I assume it’s from the same region and the same time period. In this post I’ll share some beautiful pictures of this “Margin Art” with my commentary on them. – An ordinary spread view of the book, you can see the main body text, and there is some really size text between its lines, and of course you can see the margins and how were they been utilized.